A distinctive yacht with a high-freeboard profile, the Silverton 453 MY will appeal to boaters looking for maximum living space. The 453 has molded staircases ascending to both sides of the flybridge (Silverton called them “SideWalks”) and the result is a cavernous, full-beam interior whose dimensions rival those of a much larger yacht. The resulting extra interior space allows a very innovative three-stateroom, two-head floorplan, a layout made possible by raising the galley and dinette forward of the salon. Notably, the amidships VIP stateroom of the 453 is as big as the master stateroom aft. The entire interior is tastefully finished with rich cherrywood joinery, the aft deck is equipped with a wet bar and the flybridge has lounge seating aft of the helm. 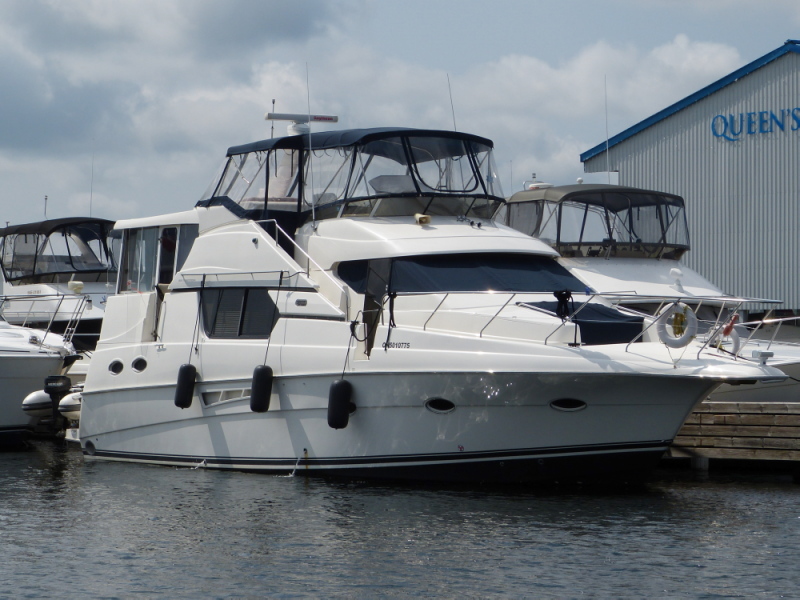 Additional features include a pilothouse deck door, large engine room, and standard hardtop.